Here you can find our active promotions on musical instruments, software, and equipment. You can also find out about Gear4music competitions. From special offers to free bundled software, get the latest deals and giveaways here! Win an Infinite Reverb Pedal! Win a MV88+ Video Kit! 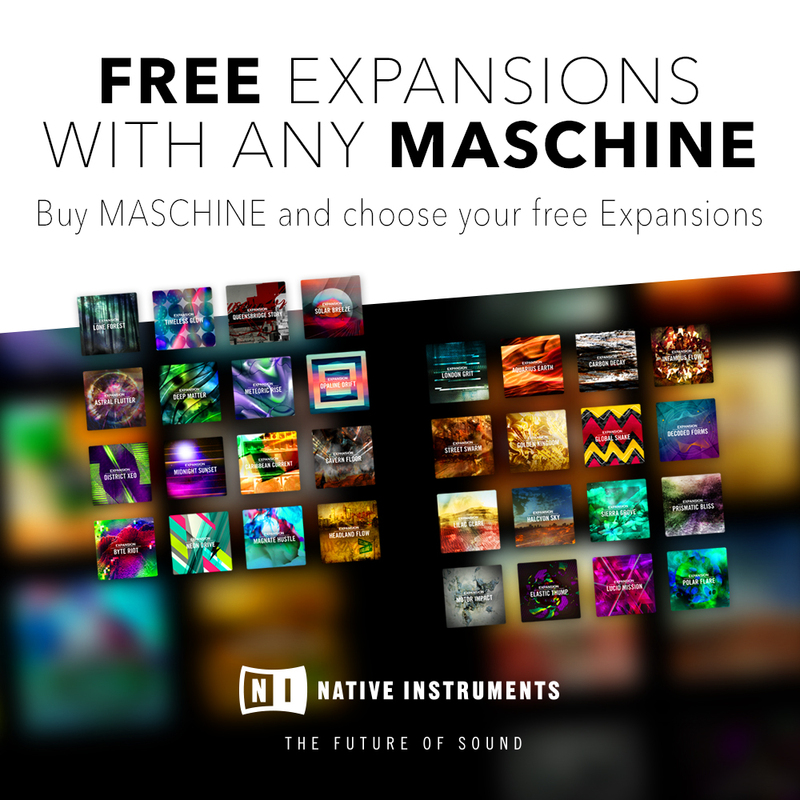 Native Instruments - Claim FREE Expansions with MASCHINE for APRIL ONLY! Expand your Native Instruments Maschine with free Expansion packs of your choice. Buy Mikro or JAM and claim 3 Expansions. Buy MASCHINE Mk3 or STUDIO and claim 5 Expansions. Register your new MASCHINE hardware on the Native Instruments website. You will receive an email containing a voucher for your free Expansions. You can then redeem this voucher in your Native Instruments account and choose your free Expansions. Native Instruments will make your selected Expansions available in Native Access for you to download and install. Promotion ends Monday 1st May. Natal - free matching snare drum with select Cafe Racer drum kits! 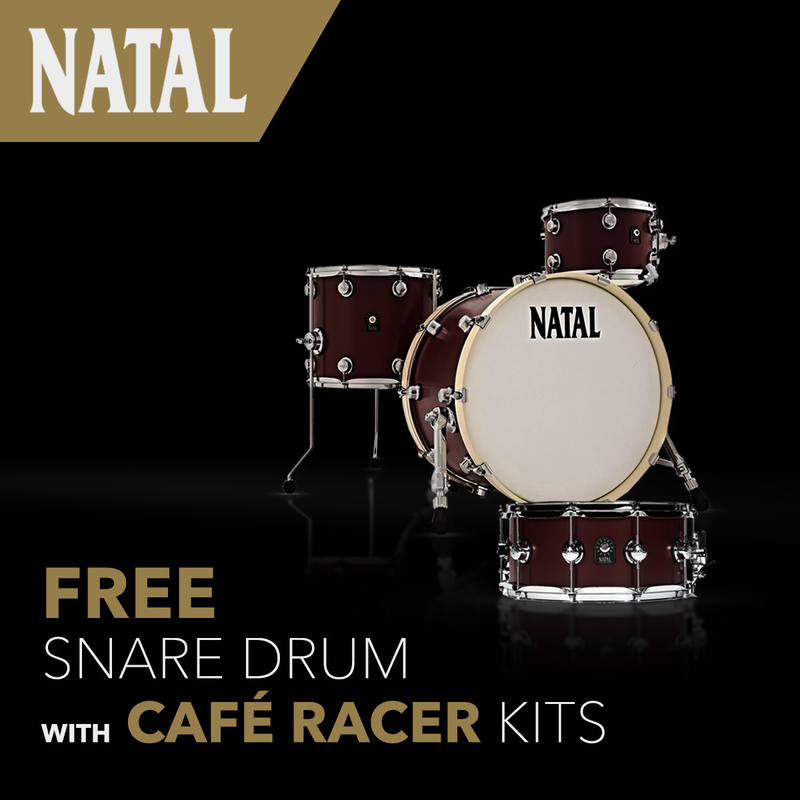 Purchase select Natal Cafe Racer drum kits and receive a free matching snare drum! Natal Cafe Racer Shell Packs offer a great foundation to any set up! Built on a dry, focused tulipwood shell, Café Racer kits are not restricted to just one style of drumming. Whether you’re performing on-stage or in the studio, a Café Racer Shell Pack provides the perfect amount of warmth and projection, whilst offering a great tuning range. Get your free matching snare drum today and complete your Natal setup! 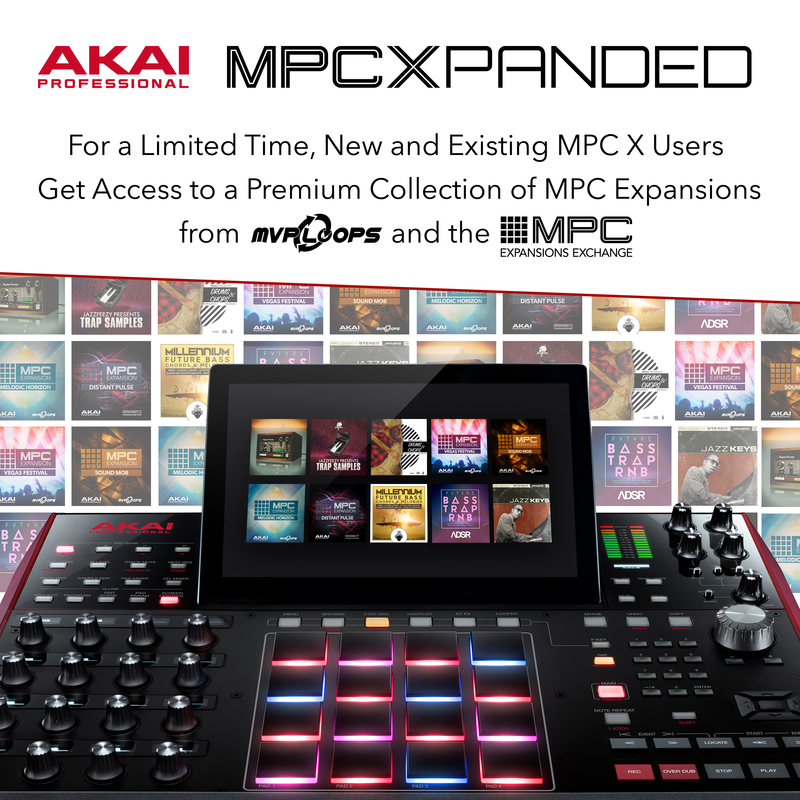 From now through to 14.04.19, new and existing users of the Akai MPC X will receive a genre-spanning collection of premium, in-demand sound content from the existing MPC Expansion collection and the all-new MPC Expansions Exchange, worth in excess of $800. From hard-hitting drums to sultry melodic lines and everything in-between, this collection from leading sound designers builds on the existing stock library, providing producers with the ultimate sound content for immediate creative inspiration. 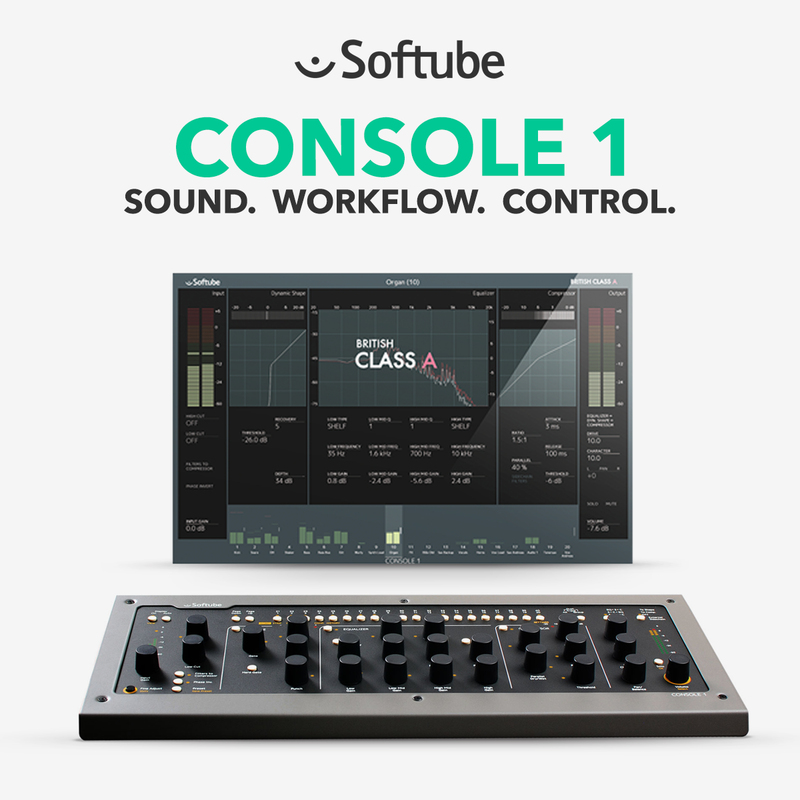 Buy a Softube Console 1 MKII before 30.04.19 and claim a free British Class A plugin, worth 174 GBP, giving you instant access to the classic sounds of the '60s/'70s. Console 1 is a system of virtual plugins controlled by an intuitive hardware controller. With the included Solid State Logic SL 4000 E console model plugin, producers can access the legendary sound-sculping capabilities of the 1979 SSL 4000 E console - a modern-day classic which has been helped create countless records with its bold and dynamic sound. The Console 1 is expandable with over 70 plugins from Softube and Universal Audio. Customers buying Console 1 before 30.04.19 will receive a free copy of the British Class A plugin, which recreates the classic British sound of the '60s and '70s. With a Drive, EQ, Compressor, Limiter, and Gate, this plugin offers an entire channel route to sculpt your mix. "Let your tracks soak in the fat transformer crunch of the input stage, get great tone with the honey-sweet equalizer, control dynamics with the beautifully musical compressor, smash them into oblivion with the limiter, and keep things tight and tidy with the smooth gate. British Class A For Console 1 collects the most coveted and distinctive sounding units of the pro audio world in a single channel." To get your free add-on, all you need to do is buy a Console 1 and then send an email to: givememybca@softube.com. In the email you'll need to include your name and iLok id. Offer is available until 30th April. Please note: This promo also includes any customers that bought the Console 1 from 1st January 2018 and forward. What is British Class A? 1) Expand your Apollo X rig (x16/x8p) with another Apollo X device (x16/x8p) and you can claim any 10 UAD plugins*, worth up to £2,476. 2) Expand your Apollo X rig (x16/x8p/x8/x6) with an Apollo Twin MkII Quad/Duo and claim any 3 UAD plugins*, worth up to £780. *The following plugins are not included in this promotion: Trident A-Range Classic Console EQ, Thermionic Culture Vulture, API 500 Series EQ Collection, API Vision Channel Strip, API 2500 Bus Compressor. Simply purchase a second qualifying device and register it to your Universal Audio account. No coupons or redemption codes are required. Your UAD Custom bundle will be added to your account automatically. Purchase a new device and register it from March 20th to April 30th, 2019. Already own an Apollo x16 / x8p? Buy an Apollo x16 / x8p. Claim UAD Custom bundle with 10 FREE plugins! Already own an Apollo x16 / x8p / x8 / x6? Claim UAD Custom bundle with 3 FREE plugins! Looking to create professional recordings? The Apollo Twin and Arrow audio interfaces feature genuine UA conversion and access to the highly acclaimed UAD plugin library. To make these interfaces even more tempting, they now come complete with FREE plugins from UAD, worth up to £688! Don't wait around though; this promotion ends at the end of June! Get FREE plugins for all your classic studio sounds, including Antares Auto-Tune Realtime Advanced, Manley VOXBOX, UA Oxide Tape Recorder, and Pure Plate Reverb. No coupons or redemption codes are necessary. Simply purchase your new UA Audio Interface and register it online. UA will automatically add the promotional plugins to your account. I Already Own One of the Promo Plugins! If you already own any of the promotional plugins, you can pick an alternative from the list of UAD plugins. Which Plugins Will I Get? Purchase a UA Apollo Twin MkII QUAD and receive plugins worth £688. 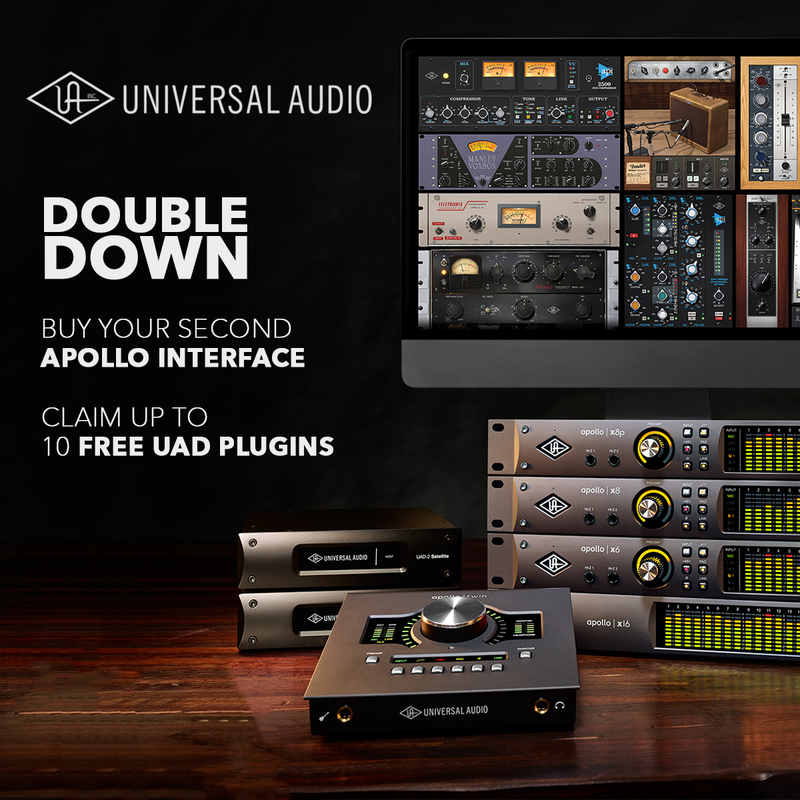 Purchase a UA Apollo Twin MkII DUO or Apollo Twin DUO USB and receive plugins worth £643. 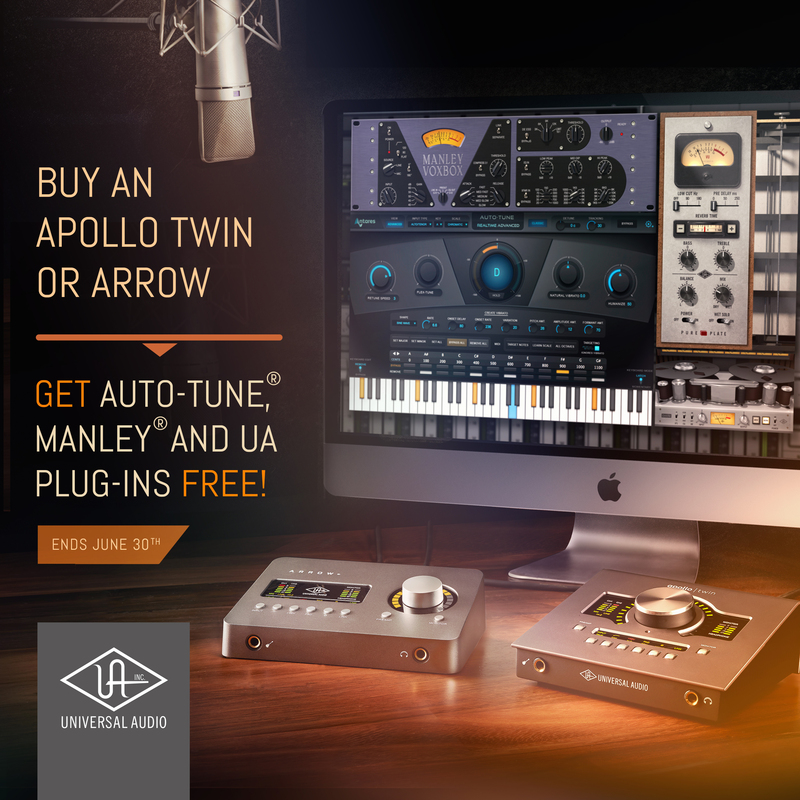 Purchase a UA Apollo Twin MkII SOLO and receive plugins worth £344. Purchase a UA Arrow and receive plugin worth £229. Offer valid only for customers who purchase a new Apollo Twin (MkII or USB) or Arrow between April 1st and 30th June 2019. Customers will receive plug-ins upon registration of their Apollo Twin/Arrow, and must register before July 15th, 2019 to receive free plug-ins. First-generation Apollo Twin Thunderbolt models are not eligible for this promotion. All promotional fulfilment is subject to approval by Universal Audio. Promotion ends 30th June 2019. 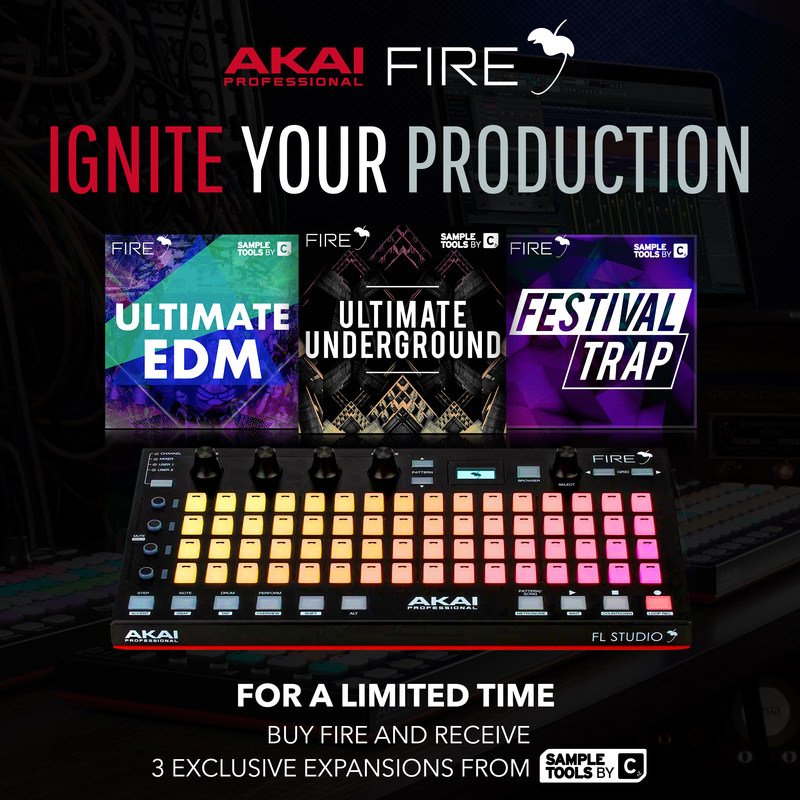 AKAI Professional - Claim 3 exclusive Expansion Packs from Sample Tools by Cr2 with Akai Fire. Ignite your production! From 1st April to 1st July, new and existing users of the AKAI Fire now have access to 3 exclusive Expansion Sample Packs from Sample Tools by Cr2. This exclusive offer gives you unrestricted access to over 1GB of production-ready samples from world-leading sample specialists, Cr2. From EDM to Trap and Underground, get the hottest samples around and turn up the heat on your production! 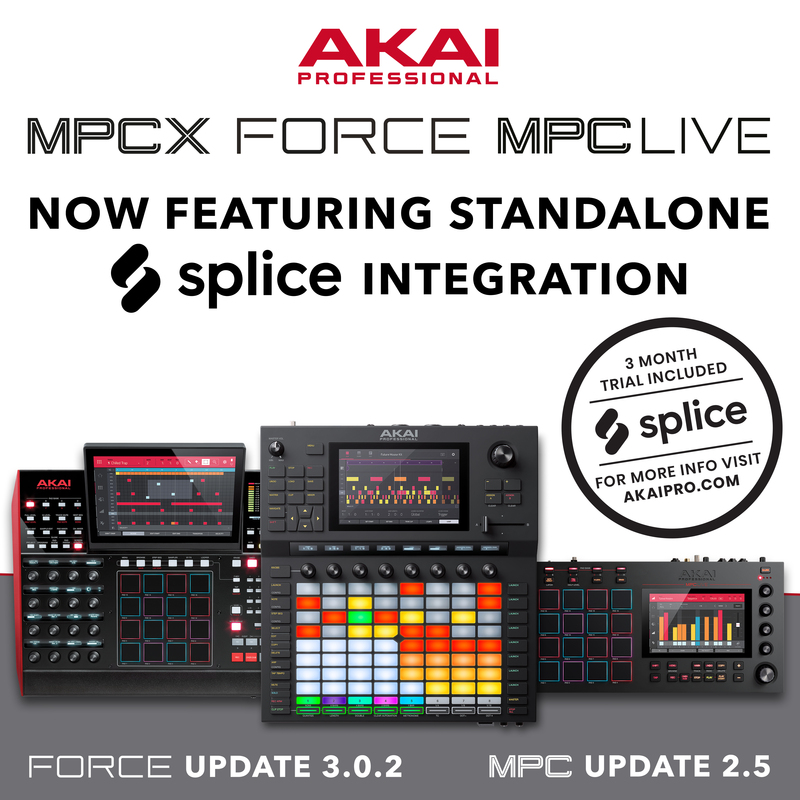 The AKAI Force, MPC X, and MPC Live now feature standalone integration with Splice! New updates mean you can use Splice directly in your AKAI device via WiFi connection. Splice Sounds provides millions of samples, layers, and loops, all royalty-free and expansive in genre. Spanning from cassic 808 drums, powerful sub beats, to that rare cymbal sample you've wanted since you heard it 10 years ago, Splice will have it. What's more, for a time-limited period, you can also claim a FREE 3-month membership to Splice! This is available for both new owners and current users of MPC X, Force, and MPC Live. 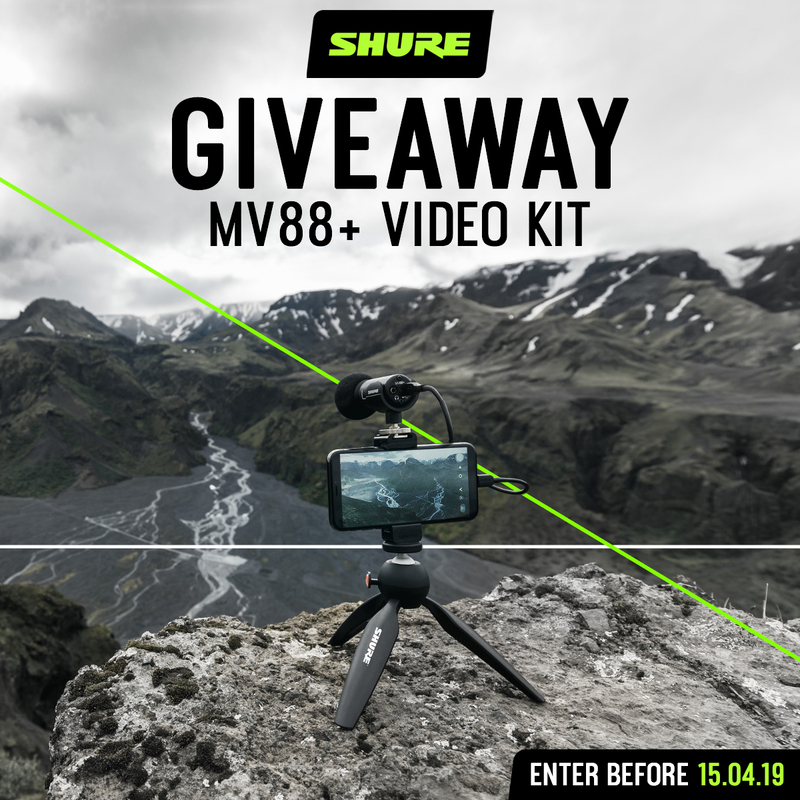 Shure - Win a Motiv MV88+ Video Kit, worth nearly £200! Enter our competition on social media to win a Shure Motiv MV88 Plus Video Kit, worth nearly £200! Simply visit us on Facebook, Twitter, or Instagram, find the relevent competition post, and follow the instructions to enter! The Motiv MV88+ allows you to record incredible audio on the go. It features a high quality stereo condenser capsule and can record directly to both iOS and select Android devices with its included cables. What's more, an industry-leading Manfrotto PIXI Mini tripod is also included for location recording or handheld use. The MV88+ is the perfect tool for videographers, journalists, musisians, vloggers, and much more. COMPETITION EXTENDED: closes on Tuesday 16th April at 12:00pm. Good luck! Toontrack - save 20% on EZdrummer 2, EZmix 2, and EZ keys! Celebrate 20 years of Toontrack by making some great savings on EZ plugins this April! 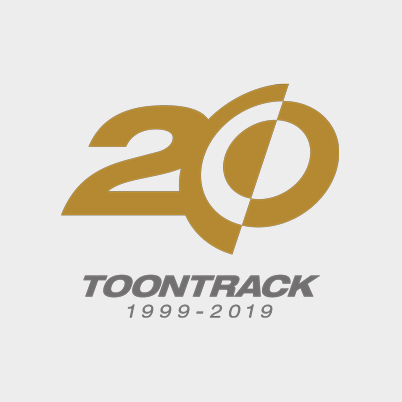 Toontrack is celebrating its 20-year anniversary by offering you 20% savings on its most intuitive production tools for songwriters! This promotion is valid for the whole of April, and April only, so don't miss out! 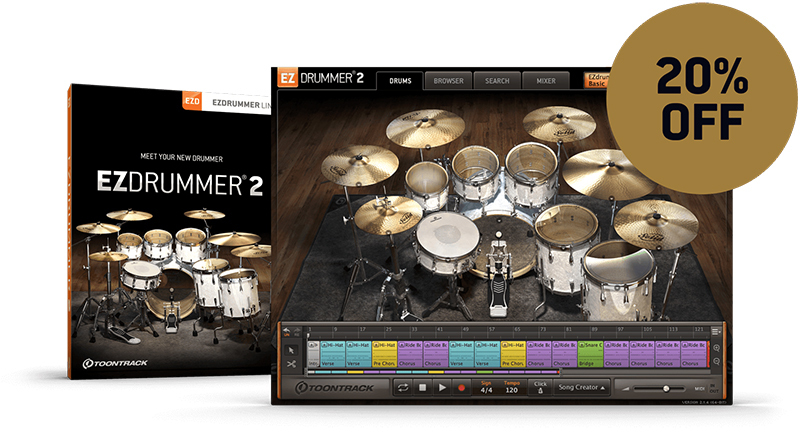 EZdrummer 2 - save 20% on one of the world's most popular drum production tools for songwriters. Designed to remove any technical barrier between you and your creativity, EZdrummer 2 is here to take you from the first idea to a completed track. With the sound of a professionally-mic'd kit and the ability to sculpt a performance to your track, EZdrummer 2 is the ultimate tool for songwriters. 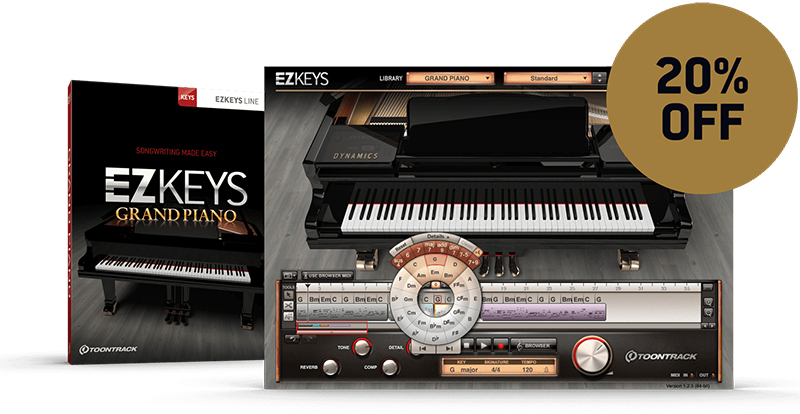 EZkeys - save 20% on the sound of premium grand pianos, classic uprights, a majestic pipe organ, a smooth electric piano, and more. Not only does EZkeys give you the sound of world-class keyboard instruments, it also helps you create your musical parts. If you're not a keyboard player, simply load in the included MIDI patterns, change the style, and get ready to create your perfect piano part in no time at all. Whether you're a composer, songwriter, arranger, or performer, EZkeys will adapt effortlessly to your requirements with premium Toontrack fidelity. 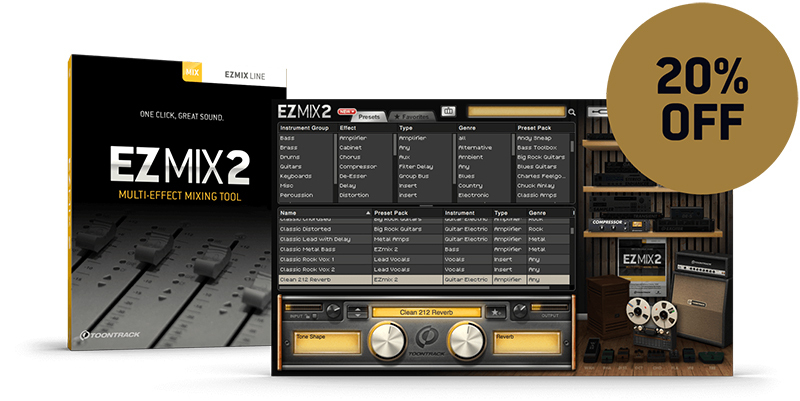 EZmix 2 - want the quickest way of creating a professional mix? Look no further than EZmix 2, and save 20% this April! EZmix 2 is a multi-effect plugin which lets you process audio with as little fuss as possible. Simply load up a preset effect chain created by mix engineer professionals, and you'll be well on your way to a polished track. No matter what the audio source, you'll find the perfect processing chain. EZmix also includes guitar/bass amp/cab simulations, so musicians can plug straight in and get a great tone, right out the box. 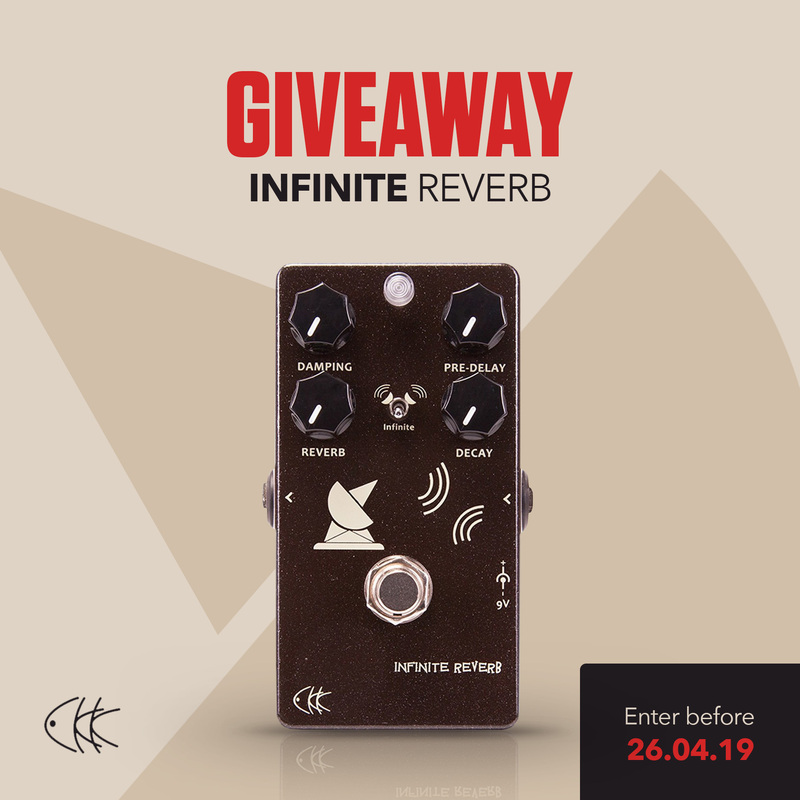 CKK Electronic – Win an Infinite Reverb pedal, worth over £100! Enter our competition on social media for the chance to become the lucky owner of a CKK Electronic Infinite Reverb pedal, worth over £100! All you have to do is visit us on our Facebook, Twitter, or Instagram pages, find the relevant competition post, and follow the instructions to enter. The CKK Infinite Reverb offers 3 reverb parameters for expansive possibilities. Ideal for both electric and acoustic guitar, this pedal can create all manor of reverb sounds. For the adventurous, turn on the "Infinite" switch and take your reverb to the next level! The CKK Infinite Reverb pedal is the perfect creative tool to saturate your sound in glorious shimmer and ambience.